You don’t need more data, you need more insight. That’s why we get up in the morning. The best insights come from understanding the world of your customer. It’s all about context. We can’t expect customers to solve our problems, or create the next great product innovation. But if you immerse yourself in their world, they will help you see those solutions and innovations. For decades, asking people the direct question was thought to be acceptable. Now we know better. We know that any human being can come up with a rational reason for anything at all, and may even believe it. Everyone is marketing savvy now, especially young people. To get powerful insights today, we have to get past this barrier. We do that with better research design, and constant innovation in our own methods and approaches. You, the client, need the insights in your head, not in ours. The magic of insight comes from creating settings where you can learn without asking very many direct questions. Tools like mobile self-ethnography can make this happen. We like to bring clients directly into the room through co-creation labs. We run immediate debriefs. Our reports and presentations are easy to digest. You won’t put them on a shelf, you’ll put them into action. You aren’t going to find a big client list here, even though we are proud of the brands and organizations we have worked with. We signed an NDA and we honor that. You’d recognize most of the names. We’d love to have your organization on this list. And we will keep your secrets, too. We’re passionate about our clients and about helping them succeed in a challenging marketplace. We try to add value from the first contact to well after the last invoice. To see what that feels like, let’s start a conversation. Susan Abbott is a specialist in customer insight and creative problem solving. Prior to forming Abbott Research & Consulting in 2001, Susan led the marketing-research practice at a boutique consulting firm. She is also a former vice-president of the TD Bank Financial Group, one of North America’s leading financial services firms, where she held diverse general management positions. Considered a leader by her peers, Susan was twice elected to two-year terms as a board member of the Qualitative Research Consultants Association. Susan is the co-founder of Think Global Qualitative, a global alliance of senior qualitative specialists. Through this alliance, we can provide clients with expert coverage of any major global market. Her educational background includes an MBA from Ivey at the University of Western Ontario, the Certified Marketing Research Professional designation, Myers-Briggs accreditation, and Advanced Creative Problem Solving training, and a bunch of other stuff. Susan’s a learning junkie who spends her free time at conferences, frequently speaking, always staying current. Does your researcher's plan make sense? Get the free guide. When you review a discussion guide, do you know what to look for? 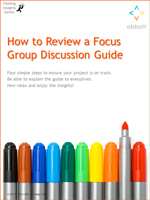 Learn what the pros consider in this brief insider guide, How to Review a Focus Group Discussion Guide. It's yours, free, to help you in any project.